Carla Cerati, Non c’è rosa senza spine (pannello n. 8, serie “Percorso. 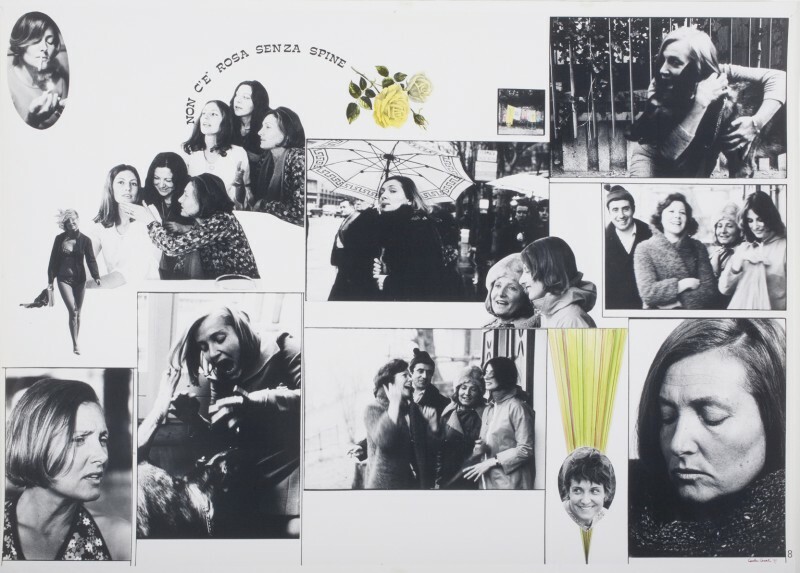 Racconto in dieci stazioni della vita di una donna”), 1977. Stampa fotografica in bianco e nero, gelatina bromuro d’argento con interventi. The figures against depicted in these shots are people literally pushed to the margins from the society, because their own existence is in contrast with the logic prevailing in the modern world; in other cases, they are figures that contrast, manifest, do not resign themselves, affirming an alternative model. But figures against are also those of the authors of these images. Giordano Bonora, Anna Candiani, Carla Cerati, Mario Cresci, Uliano Lucas, Paola Mattioli e Giuseppe Morandi. Each according to their sensitivity and their language have contributed to transform photography into a critical tool but also an instrument of reflection, useful to inform about what Italian society was during the economic booming.